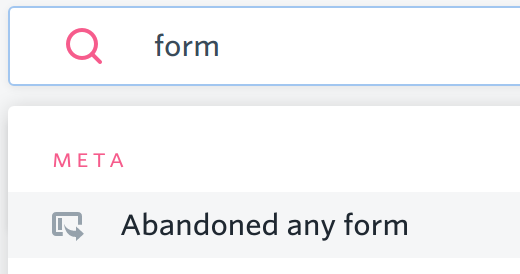 You can use FullStory's Abandoned Form search to easily find users who began to interact with a form element but did not complete the submit event. There is no instrumentation required, as FullStory will automatically find and treat all of the <form> elements on your site. Use this one click search to quickly filter down to user sessions where a form abandonment occurred. Watch sessions, then dig deeper for root cause with Searchies and Page Insights. The default search will be for "Has abandoned any form". This will return all users with sessions in the time frame indicated where a form was abandoned. When watching a session, check for the highlighted Abandoned Form event(s) in the events bar. Watch what happens before and after they abandon the form. Look for console errors or warnings, mouse thrashing, rage clicks, or poor UX that led to the abandonment. Click Page Insights at the top right of the screen to view click maps and view aggregate data for users who encountered this form. Hone your search to sessions of specific abandoned forms by using the form's unique CSS selector, which can be found in the events bar. Your <form> elements must have a submit event as a part of the form OR have a button keyword that we've identified as a common submit event (such as 'Checkout', 'Purchase', or 'Submit'). 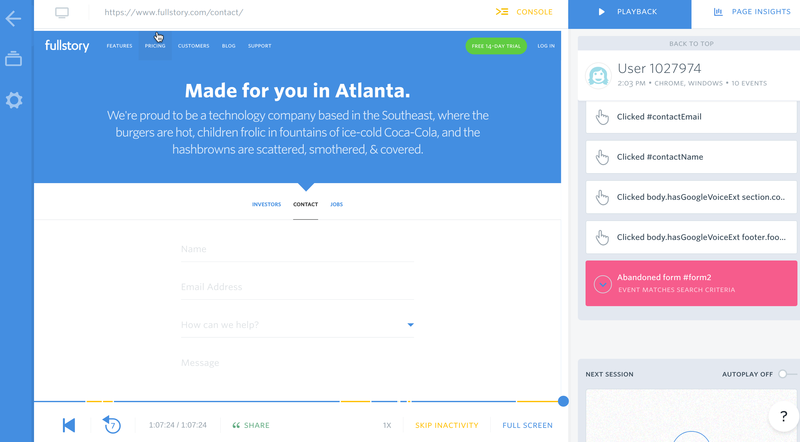 When a form submission fails on the client side, FullStory will be sure to mark that as form abandonment. However, if there is a server side submission error, FullStory won't treat that as an abandonment since the the submit event was caught. FullStory marks each instance where a form is abandoned in a session, regardless of if the form is eventually completed in that session or a following session. FullStory waits until a page is no longer recording events before deciding that the form has been abandoned. This means if a browser window is closed, the user navigates away from the page, or a session ends and a new session begins due to inactivity before the form is submitted, it will count as abandonment. What if I have false positives? We are constantly tweaking our algorithm to improve results and remove false positives. Even so, there may be an abandoned form on your site that you don't wish to appear in your search results. You can use `fs-ignore-form-abandon` to ignore these forms and remove them from your results.